Dow Schofield Watts’ corporate finance team in Yorkshire & the North East, led by Roger Esler and Tony Norwood, has been shortlisted in three categories in the Insider’s Yorkshire Dealmakers Awards 2016. The team is in the running for the Corporate Finance Advisory Team of the Year award. DSW also been shortlisted in the Deal of the Year category for three separate transactions – the trade sale of Colt Industrial Holdings to Augean PLC, the Management Buy-in of Sash UK backed by Praesidian Capital and the cross border trade sale of Simon Gibson Transport to Groupe Charles Andre of France. 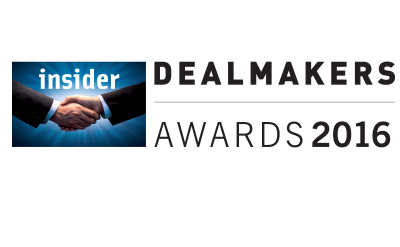 Roger Esler has also been nominated for the Dealmaker of the Year award. The winners will be announced at the awards dinner at New Dock Hall in Leeds on Thursday 10 November. The latest news follows the success of DSW’s North West Corporate Finance and Transaction Services teams who won three awards at the 2016 Insider North West Dealmakers Awards.